Ask about quantity discounts for purchases of 2 or more! Believe it or not, there is currently only one company still making high quality bath towels in the USA: 1888 Mills based in Griffin, GA. Strictly USA is pleased to be one of the top online sources for these towels. We have a direct pipeline into the mill, which allows us access to all the popular styles and colors at very competitive prices. 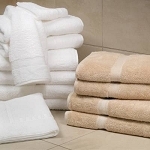 Towels are available separately and we have also put together two different complete sets, the Elite Towel Set and the Deluxe Towel Set. Two colors available: Natural Linen and White. Natural Linen is a very light tan--see pictures. Quantity discounts available for 4 or more of a particular style. Please call first! Note: These towels cannot be purchased directly from the manufacturer. Customers must go through authorized retailers, like Strictly USA. 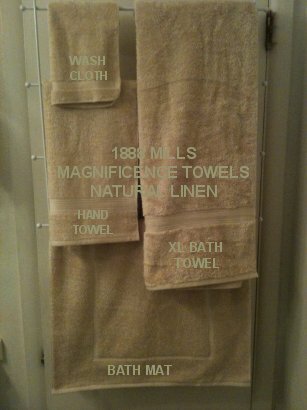 BATH TOWEL: Regular Bath Towel is 27" x 54". These are the best towels I've ever had. Soft, fluffy, and very absorbent after being washed just a couple of times. We bought washcloths, hand towels, and bath towels. The hand towels are a little over-large, but no big deal. Do watch the shipping charges, as the customer service page mentions. Ours came in over double what the "flat rate" should have been. We called before we ordered and were assured they would credit us back the difference at shipping time, and they did so as promised. Quick shipment and receipt too! These towels are so fluffy and absorbent- just like towels used to be. I am impressed with how soft they are and with no shedding in the washer/ dryer. Well worth it! I have had these bath towels for a few month now. I purchased them because they are made in USA. The quality is excellent, and I will definitely buy more. While these might not be life-altering, ground-breaking, "Forget everything you knew" towels, they're still high quality and, most importantly, American made.